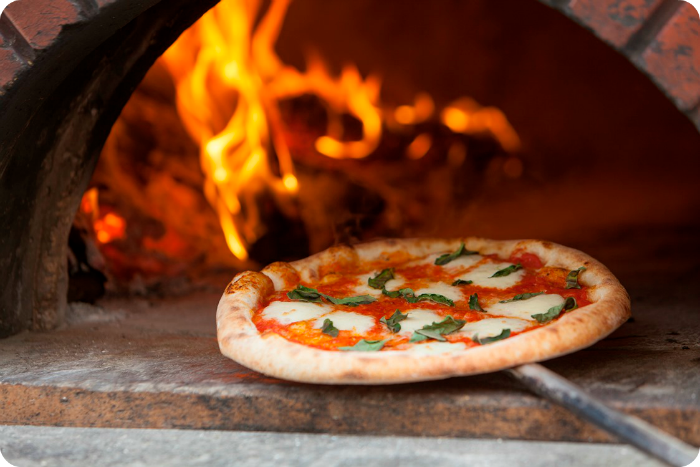 We always bring our imported Neapolitan wood burning oven and bake all pizzas fresh on site. We serve for 2 hours and pizza is unlimited during serving time. We use only high quality, carefully sourced ingredients. Our dough is made the old fashioned way with a “criscito”, or wild yeast. Pizza and salad are served buffet style on a rustic wooden catering table so guests can eat all different types of pizza. If someone wants their own personal pie (or gluten free pizza) we can do that as well. There are about 8-9 different types of pizza on offer. Our crew is always fast, friendly, and professional. We bring our own electricity and potable water. We also provide napkins, high quality paper plates, and forks. All pizzas baked fresh on site! Is two hours enough time to feed my entire party? Yes. Our crew is very fast. Our oven holds six pizzas and they bake in 2 minutes. Two hours is more than enough serving time. We offer free tastings at our public events. There is no obligation to book. To set up a tasting, please email or call / text 760-331-3775. Absolutely. We cater events of all sizes. We are capable of serving up to 500 guests in two hours. Yes. We do about 50 weddings every year. Wood fired pizza always goes over really well at weddings. Our crew wears white button down shirts for weddings and other formal events. How do you keep pizzas warm on the catering tables? Pizzas go right from the oven to the catering table. We closely monitor the table. If a pizza sits too long we take it away and replace it with a fresh one. It depends on the size of the party. But we typically arrive about 1.5-2 hours before serving time. We take a small deposit up front. Final payment is due on or before the day of the event.